LAURENCE, Margaret. 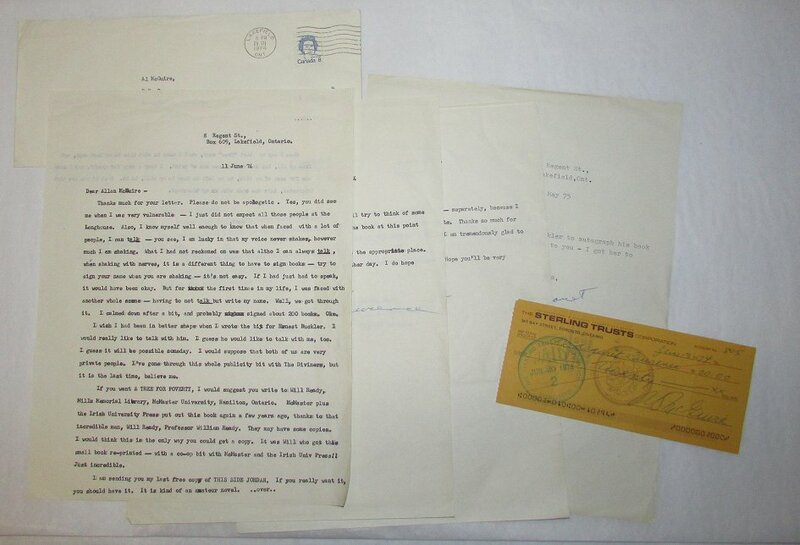 A small group of letters from Margaret Laurence to collector Allan McGuire as the two sent signed books to one another. 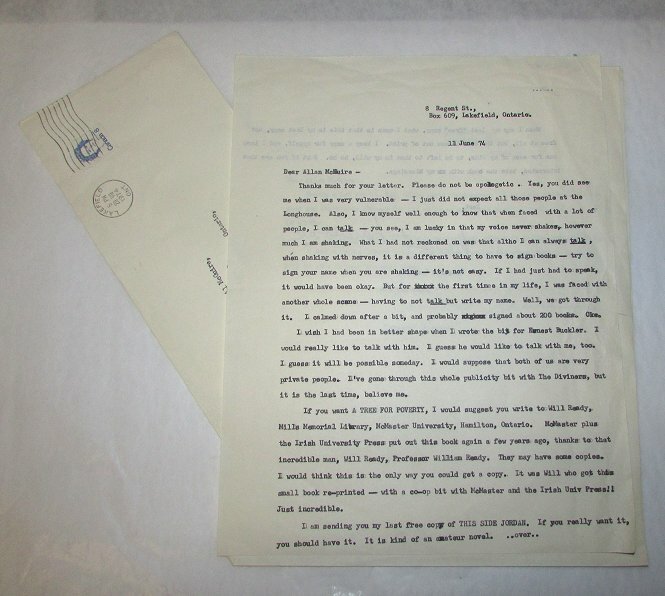 A small group of letters from Margaret Laurence to collector Allan McGuire as the two sent signed books to one another. 1 TLS from Margaret Laurence to Allan McGuire. 11 June '74. 8 Regent St., Box 609, Lakefield, Ontario. 1 ½ pp (one sheet), 8.5�x11�. McGuire contacted Laurence as a fan after meeting her at a signing for The Diviners. McGuire, a well-known and very passionate book collector in the 70s and 80s, had the habit of contacting writers he admired and initiating friendships which sometimes resulted in friendly correspondence. He did this with Ernest Buckler and visited Buckler in Nova Scotia regularly, becoming a close friend. McGuire met Laurence at the signing held at the Longhouse Bookstore in Toronto. McGuire later recounted the details of this signing and the obvious terror and literal shaking of Laurence, which Laurence herself describes in this letter: “What I had not reckoned on was that altho I can always talk, when shaking with nerves, it is a very different thing to have to sign books.” She goes on to say she wishes she had “been in better shape when I wrote the bit for Ernest Buckler. I would really like to talk with him.” And later: “I would suppose that both of us [she and Buckler] are very private people. I’ve gone through this whole publicity bit with The Diviners, but this is the last time, believe me.” She tells him how to acquire a copy of A Tree for Poverty and sends along her last copy of This Side Jordan. Signed in full. 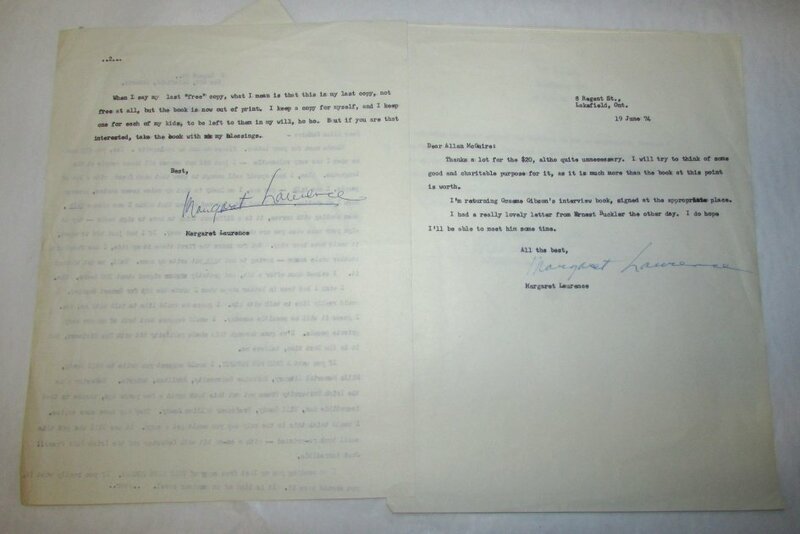 1 TLS from Margaret Laurence to Allan McGuire. 19 June ’74. 8 Regent St., Lakefield, Ont. ½ page (6 lines), 8.5”x11”. Thanking McGuire for a cheque, presumably for the copy of This Side Jordan previously mentioned, and sending back “Graeme Gibson’s interview book, signed at the appropriate place.” Another mention of Buckler, having just received a “really lovely letter” from him. Signed in full. 1 personal cheque made out to Margaret Laurence from Al McGuire for $20. June 13 1974. With Laurence’s signature on the reverse and “(J. M. Laurence)” just below it, in her hand. 1 TLS from Margaret Laurence to “Al” (Allan McGuire). 28 July ’74. P.O. Box 609, Lakefield Ont. Half a page (6 lines), 8.5”x11”. With typed envelope. Notifying him that a separate package will arrive with his proof copy of The Diviners signed, and thanking him for sending a signed copy of Buckler’s The Cruelest Month. “I am tremendously glad to have it. Am writing him today.” Signed “Margaret”. 1 TLS from Margaret Laurence to “Al” (Allan McGuire). 14 May ‘75. 8 Regent St., Lakefield, Ont. Less than ½ page (3 lines). Thanking him for getting “Ernie” Buckler to sign a book for her, sending him a signed copy of Clara Thomas’s book. Signed “Margaret”.